How to watch TV on Linux - TV-MAXE is an application which provides the ability to watch TV stations and listen radio via different streams, such is SopCast. Currently it has a large number of channels, both romanian and international. As most we know if TV-Maxe is an alternative for Sopcast, enabling the users to easily watch both international and Romanian TV channels. 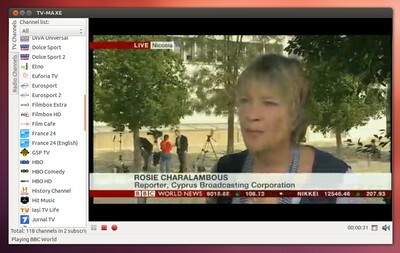 Among others, it supports Gstreamer, VLC and HTTP remote control. TV-MAXE is available via ppa, so to install it is easy. That's all I can write about how to watching a television programs by install TV-MAXE Ultimate TV For Linux. Hope you've enjoyed reading this tutorial as much I’ve enjoyed writing it. Thanks for visiting us.